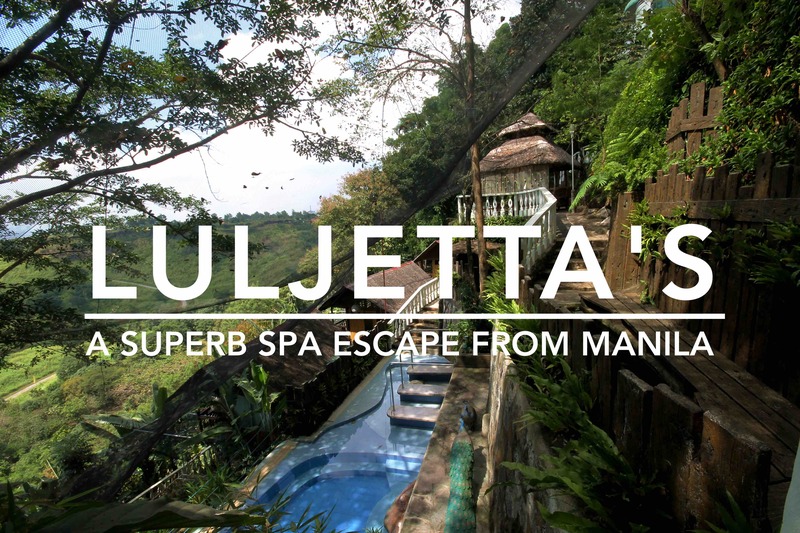 Located within the sprawling Loreland Farm Resort, 4 km from the city center of Antipolo, Luljetta’s Place Hanging Gardens Spa & Garden Suites is situated along a mountainside with impressive views overlooking grassy hills and, in the distance, Laguna de Bay and the Metro Manila skyline. Set in garden terraces filled with flowering plants and linked by a maze of stairs, their amenities include two small infinity pools, a hydromassage pool, sauna, fish spa and heated jacuzzi. One may use all their amenities for up to seven hours when you avail of their resort packages like the Hanging Gardens Retreat (PHP 1,150 per person), which includes welcome drinks and snacks of specialty suman (sticky rice), or the Hanging Gardens Getaway (PHP 1,750 per person), which includes two snacks and a four-course wellness menu for either lunch or dinner. Both packages are exclusive of spa services. Ahhhhh, relaxing at the hydromassage pool. There are ethnic-inspired lounges for you to read or simply kick back and relax. While the beautiful setting exceeded my expectations, the amenities themselves can be improved. I enjoyed their outdoor fish spa, which was filled with the largest doctor fishes I’ve ever seen! They might want to reintroduce smaller fishes again in a separate pond, so guests can experience different “intensities” of fish spa, just like being offered a choice of either soft or hard pressures during a massage. Unfortunately, the infinity and hydromassage pools were uncomfortably cold during our visit, perhaps due to the cooler season and higher elevations of Antipolo City. Moreover, the sauna and heated jacuzzi weren’t warm enough to console us after a chilly dip in the pools. While the cold-water pools would be more inviting on a hot summer day, the resort might want to consider installing heaters to warm them up during rainy days or cooler months. Bamboo huts provide a rustic place to enjoy their signature massages. Their massage treatments were excellent! I highly recommend Luljetta’s for their massages, however. Their well-trained therapists were friendly, courteous and professional. We enjoyed the one-hour Luljetta’s signature full-body massage (PHP 750), which expertly combines Swedish, shiatsu and Thai techniques, at a native-inspired massage hut with glass windows overlooking the city lights at twilight. Guests also have the option to enjoy their massage services in air-conditioned rooms, but we preferred the rustic ambiance of the fan-cooled huts. Soothing aromatherapy oils were placed underneath the massage bed to enhance the whole experience. The massage was so relaxing that I couldn’t help but fall asleep towards the end of the session. The following day, we also enjoyed their equally amazing Flawless Feet foot spa treatment (PHP 580) at their garden gazebo. I can honestly say that Luljetta’s offers one of the best massage experiences! Aside from body massages and foot spas, the garden spa also offers facials, hand reflex, head or back massages, herbal foot bath, and royal body mask. While their resort amenities need to be improved and upgraded, their excellent spa services – most especially their signature full-body massage – offered in a private and relaxing setting with breathtaking sunset views make Luljetta’s Hanging Gardens Spa a superb getaway from Metro Manila, as the place may be reached in an hour, whether you’re driving your own car or taking public transportation. The infinity pool overlooks the rally countryside and the city skyline in the distance. End the day watching the sunset from the infinity pool. Metro Manila’s skyline looms in the distance – under the fiery skies of dusk. Luljetta’s Hanging Garden Spa offers different spa packages for daytrippers, depending on your relaxation needs. Visit this page for their complete menu of services. In 2016, Luljetta’s Place annexed their own accommodation, the Luljetta’s Garden Suites, located near the entrance of Loreland, a 10-minute walk from the Hanging Gardens Spa. The annex also has its own swimming pool and hydromassage beds. Rooms come with five-hour access at the Hanging Gardens Spa for guests. Find discounted rooms here. Another option would be to book a room at the adjacent Loreland Farm Resort located right next to the Hanging Gardens Spa. Luljetta’s Garden Suites has a private hydromassage pool. Wooden furniture make the rooms at Luljetta’s Garden Suites warm and homey. Meals from Loreland Farm Resort are served at the al fresco dining area of Luljetta’s. Many dishes were lackluster, but those that stood out from the rest were the tuna pesto (PHP 130), bangus belly sinigang sa mangga (milkfish with green mango soup) (PHP 395), and beef steak tagalog (PHP 130). I also couldn’t get enough of their iced lemongrass tea (PHP 40), which they serve in hipster mason jars! Craving for some tuna pesto? Cool off with these jars of iced lemongrass tea. Take a jeepney from the corner of EDSA and Shaw Boulevard in Mandaluyong City to Antipolo Church (PHP 27, 45 minutes in light traffic). From the vicinity of the church, charter a tricycle (PHP 60) to Loreland Farm Resort, where Luljetta’s Hanging Gardens Spa is located, 4 km from the city center. Alternatively, there are Antipolo-bound vans (PHP 60) at Ayala Center Terminal in Makati City, but only depart starting 4:00 PM. Going back to Metro Manila, vans bound for Ayala Center/Ayala Avenue also depart from near the church. I’d also like to thank Blood Red Clothing for my swimwear – learn more about this innovative apparel brand in my previous post. Operating Hours: Monday to Thursday from 12:00 PM to 9:00 PM; Friday to Saturday from 10:00 AM to 11:00 PM; and Sunday from 10:00 AM to 9:00 PM. Hi! We’re inviting you to check out our resort in Bulacan! Los Arcos de hermano resort would love to be featured to your site, Pls lemme know how. Hi Cheena! Sure, I’d love to visit your resort in Bulacan some time! Very informative post but wish you posted room rates. The place is a paradise, but terrible service. They have issues on packages since there are two managers for the spa and the rooms. Oh, I’m sorry you had a terrible time there. I hope they fix their issues soon. Did you get to talk to the managers about your experience? I did, but our massage was booked on the next day, because your reservation package doesn’t have a bearing on the massage. Also they have a different package online, which doesn’t exists anymore. It was very hard to relax with the things that happened. Hi Nichole, please contact the spa for inquiries. Thanks for dropping by! Damn I know this freakin’ resort this is where I lost my whole body bag (containing phones, money, other gadgets) was stolen with the fact that only me(coz I have our room key) and the staffs of the resort (extra key). I reported my case the very same night and they mentioned to me that they have this protocol that ones there is a reported case of theft the staff on duty during those times are not allowed to leave the workplace. Then, When I tried to follow-up my case the next day the staffs accused me of being drunk the night I lost it and left the door open where in fact I have witnesses that can attest that I did not have any alcohol intake during that night moreover I learned that the staffs on duty during that night already left the resort then I lost hope of retrieving my stuff after hearing that. Moreover, I am not the only one who lost some stuff but also my fellow campers lost valuable belongings such as necklaces, speakers, and some materials in the event hall. Another thing hahahaha not to mention…… When we checked-in there were slugs in the bathroom and the bed bugs were on feast during our stay. there were several door locks that were broken so we have to transfer rooms. Last thing cockroaches keeps on coming out of the sink and drainage lol. do you have their direct number by any chance? I don’t care about the theft review, my belongings are our responsibility.